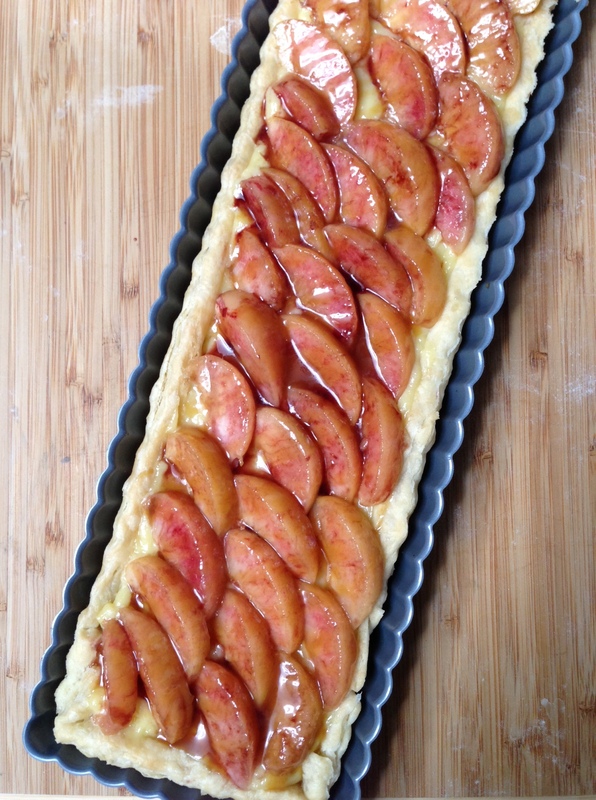 In Part 1, I basically lined out what I did to prepare for a baking extravaganza. Now I think I’ll go cake by cake and go over how the assembly went and what I might do differently, or what I would definitely do the same because deviating did not work out so well for me. Oh, hello March. I know February is a short month, but I really didn’t expect those last couple of weeks to get sucked into a vortex. It’s getting to the point where I am embarrassed to say I’m a food blogger anymore. Not because being a food blogger is embarrassing, but because it’s hard to say your a blogger when you post once a quarter (if even that)! So, my incredibly patient and sweet and tolerant husband had a birthday last month and we celebrated by drinking a trail mix beer he helped brew at Benchmark Brewing. Since we were already gathering people in one place, I figured it would be a good time to blow out candles and eat birthday cake, too. For some reason, I’ve been on a Milk Bar baking tear, wanting to make everything in the cookbook but not wanting to eat it all myself. I mean, I DO want to eat it all, but there are jeans in my closet yelling at me to not eat it all, maybe not even eat half of what I want to shove in my mouth. So, I take advantage of parties to bake to my heart’s content while pushing butter-and-sugar-laden treats on other people. I’m not going to detail out the recipes for you or even post photos of the entire process of building a cake. Mainly because I didn’t take photos of the process (I was making THREE cakes – who has time to set things down and pick up a camera while doing that?) and also because a lot of the recipes are on the Milk Bar site. There are also numerous people who have photodocumented their cake assembly process, like Serious Eats and BakeLoveGive, whose cake-making adventure at a Milk Bar class is likely what prompted me into this mini-obsession. 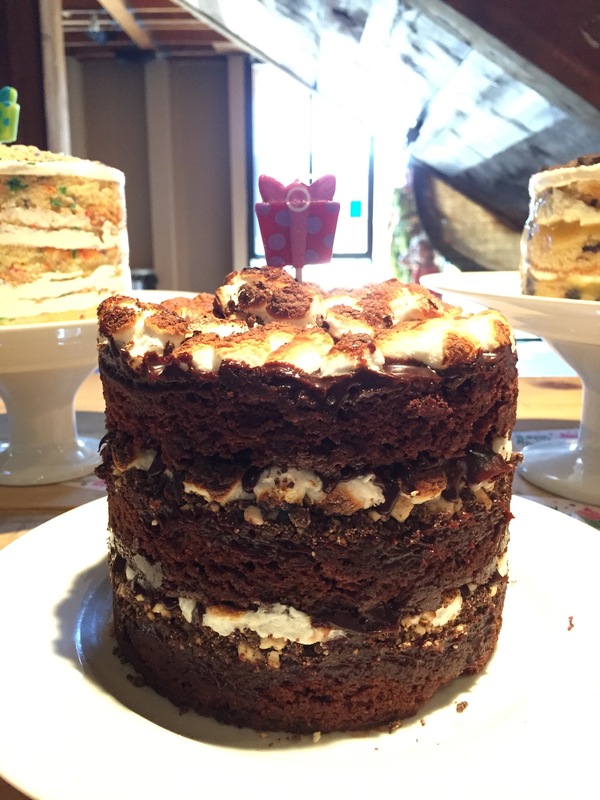 So, instead I’m going to tell you some of the tricks I learned while making 3 cakes in a week and confessing what I thought would work but didn’t (so you don’t have to make my mistakes, as delicious as mistakes are). It feels like I’ve run into quite a few people lately who are recent transplants to San Diego. They all seem to have landed here from areas that experience more “weather” than we get here, so it’s been interesting to hear their perspectives on our late-season warmth, lack of green landscaping, and what we call “cold weather”. Having lived all my life in Southern California (although, not in San Diego), I suppose I’m just used to our “mild Mediterranean climate” (a phrase I’ve been typing a lot in reports when describing the region). But, as mild as our weather is, I’ve been here long enough to know what’s coming. Winter is cold (you know, like 60-degree cold), dry, and wet if we’re lucky. Spring is where weather gets confused and it could be sunny, rainy, warm, or cold, otherwise known as keep a light jacket in your car all the time season. And that moves into a mild and sometimes chilly summer that leads into a 2-week (or more) heat wave. The weather starts to cool down, only to trick us (and my plants) with another warm spell, which might explain why Halloween costumes get smaller and shorter every year. Then comes warm days with chilly nights (my favorite) that signals fall. This is when we get maybe a month of scarf-wearing season (for warmth, not style) and I feel justified ordering a hot peppermint mocha because it’s actually cold enough. Iced peppermint mochas just aren’t the same. We get to fire up the fireplace and get cozy, and the electric blanket even makes an appearance. Even though the winter solstice is just a little over a month away, to me, fall is just getting going. 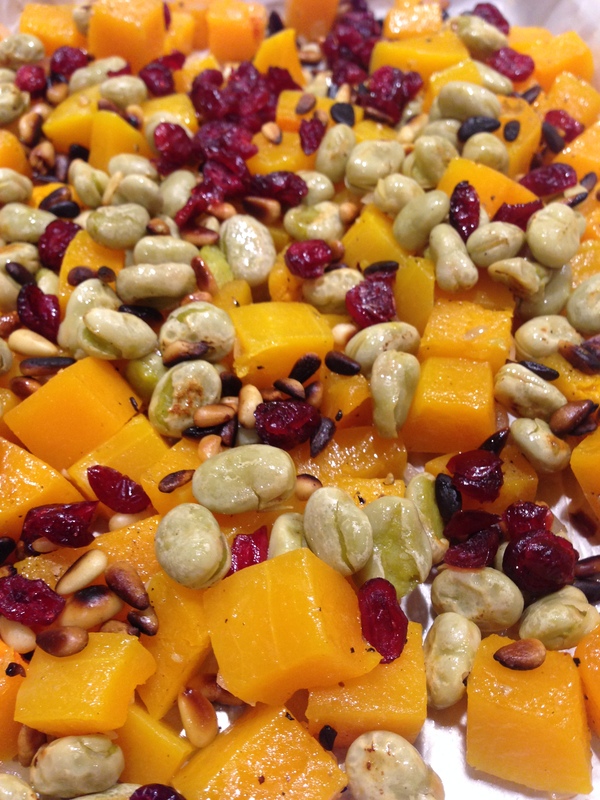 The colder weather makes me crave roasted vegetables, squash, and soups. It also makes me want to slim down to counteract the extra layers of clothing I’ll have to pile on to stay warm. And so, I make roasted veggie “salads” that don’t involve persky lettuce leaves. Disclosure: This post is sponsored by Melissa’s Produce to benefit Alex’s Lemonade Stand: Foundation for Childhood Cancer. 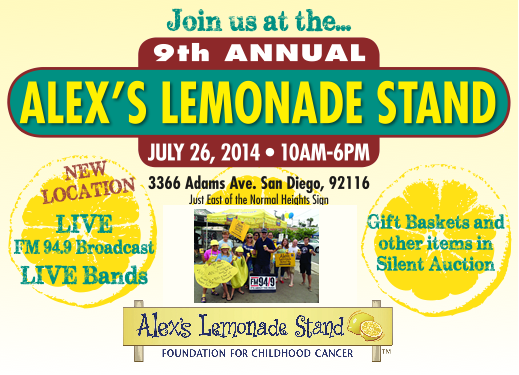 This week I’m partnering with fellow San Diego Food Bloggers to support Alex’s Lemonade Stand. If you’re in San Diego, the event is is coming up this weekend: Saturday July 26th, 2014 from 10 am to ­6 pm at 3366 Adams Avenue, 92116. FM 94.9 will be broadcasting live at the Masonic Parking Lot all day. Come to enjoy bands, lemonade, a silent auction, kids’ activities, and more! This lemonade stand is the biggest fundraiser in California and one of the top ten Alex’s Lemonade Stands in the country. Since its inception, Alex’s Lemonade Stand has raised over $80 million for childhood cancer, and has funded more than 450 research projects at 94 institutions.They also help families struggling with childhood cancer through a Travel Fund and an annual Educational Symposium. If you can’t attend, click here to donate. Your donation of $50 funds one hour of research. Let’s help the Miller Tribe reach their goal of $15,000 this year, getting them to $100,000 for the nine years they’ve been running. I’m participating in the San Diego Food Bloggers Lemonade Online Challenge, sponsored by Melissa’s Produce More than a dozen San Diego Food Bloggers will be cooking with lemons in support of Alex’s Lemonade Stand. Check out their lemony recipes online between July 21-­28, and make a donation to the Stand through links on their blogs. All their recipes will be linked to this post too! Many thanks to Stephanie at Recipe Renovator for coordinating this effort! Disclosure: Melissa’s Produce provided me with a box of produce as part of the San Diego Food Blogger Challenge but was not compensated for my review. As always, all opinions are mine. I really thought I’d have more free time this year. Then we got into a pretty major remodel (we’re adding a second story master bedroom and bath, which required half of our existing first floor to get rebuilt/reinforced), my job sucked up a lot of time, and I think I just lost all motivation and energy for anything. Then I changed jobs (or, rather, companies since I’m still doing roughly the same thing) and almost immediately felt happier. Not lying, that one change improved my attitude immensely. But we were still dragging through the remodel, crammed into the front room of our house with 3 dogs and 2 cats. This weekend, we hit a major milestone with the remodel – the first floor of the house was finished to a point where we could start moving furniture out of the front room and into the rest of the house. In just a single day, we expanded our living space 4-fold and got settled into our new family room (pictures to come, I swear, unless you follow me on Instagram where I’ve been periodically posting photos as we go.) All of a sudden, I just wanted to get into the kitchen and bake. Instead of just going to the kitchen to eat. Hey – did you think I fell off the face of the earth? I kind of feel like I did. It’s been too tiring to decide whether something is “blog-worthy” or not or if I care enough about something to spend time editing photos and then writing about it. Sorry about that. I’m a terrible blogger, what can I say? Similar to the jalapeno plants, tomatoes are always present in my summer garden. 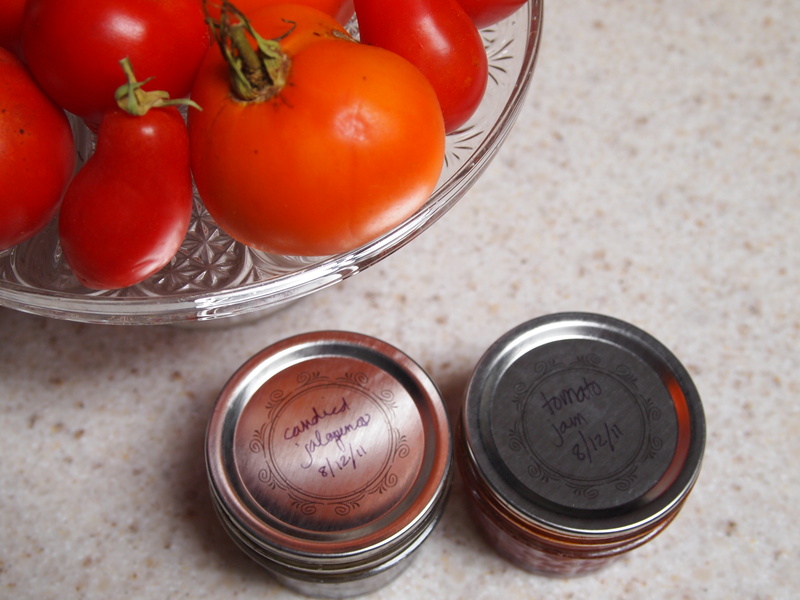 Beefsteak, heirlooms, cherry, and some sort of plum tomatoes are usually in the mix. Travis loves a good beefsteak tomato sliced onto a sandwich. I feel there’s nothing better than a warm, just-picked heirloom tomato drizzled with olive oil, sea salt, and a chiffonade of fresh basil from the garden. The cherry tomatoes are for salads or oven roasting with garlic (scooped up with crusty baguettes). And the plum tomatoes get crushed and canned or pureed into sauce. I’ve tried growing San Marzano varieties and they don’t do well, so I just stick with the hearty plum tomato starts from the nursery.